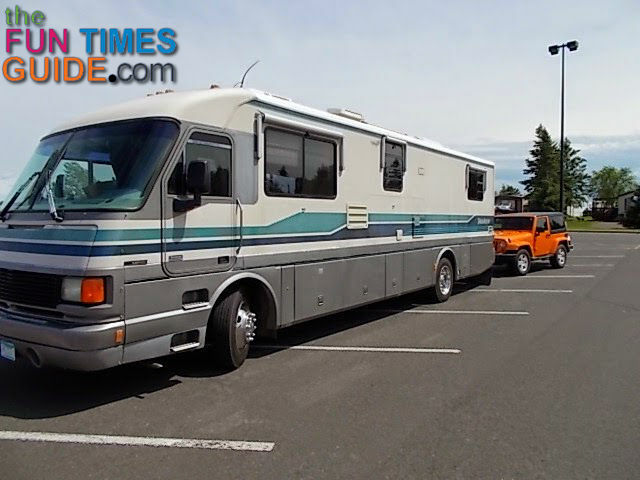 The ideal way to take a vehicle with you when traveling in a class A motorhome is to flat tow one behind you. 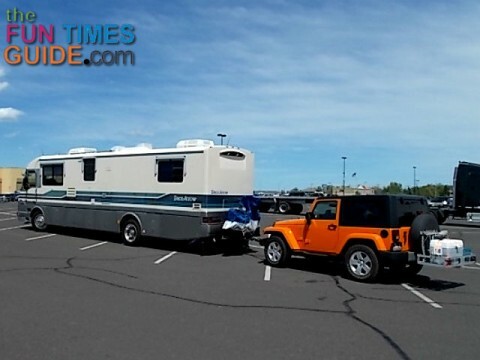 One of the best tow vehicles is the Jeep Wrangler. That’s what I tow behind my 1993 Pace Arrow diesel pusher. Today I’ll show you how to install towing lights on almost all vehicles — in the quickest, easiest, and least expensive way. Yes, you can usually wire the existing taillights on most cars to function with the motorhome taillights. However, unless you are adapt at working with automotive wiring, then the cost of those modifications will mount up quickly. There’s also a special converter to match your car’s wiring to the motorhome — because the turn signals on your car are most likely separate from the brake lights (something that’s not the case on many motorhomes). Then there’s the need for diodes to prevent feedback between the 2 vehicles. This is all doable if you throw enough money at the project. But the quicker, easier, and cheaper way is to use magnetic tow lights! It easy to find a cheap set of magnetic tow lights for less than $20. Now, not everyone wants to take the chance of damaging the finish on their car. So I don’t recommend attaching magnetic tow lights to the vehicle in tow. Instead, I recommend attaching them to the rear corners of the cargo carrier on the back of the vehicle you plan on towing. 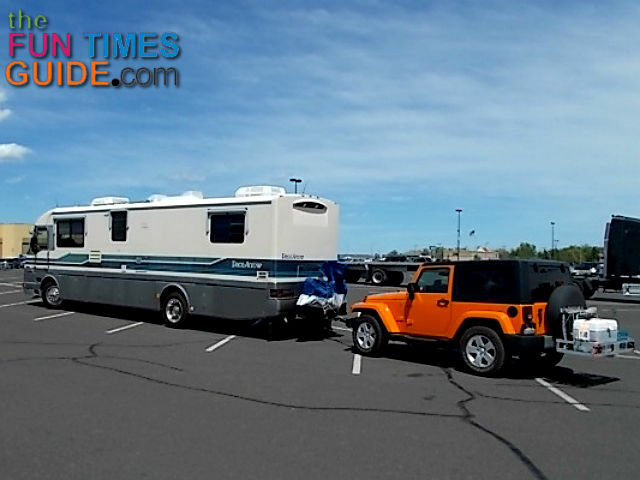 Most vehicles — especially SUVs suitable to be towed — come with some sort of receiver hitch on the back. That is very useful. 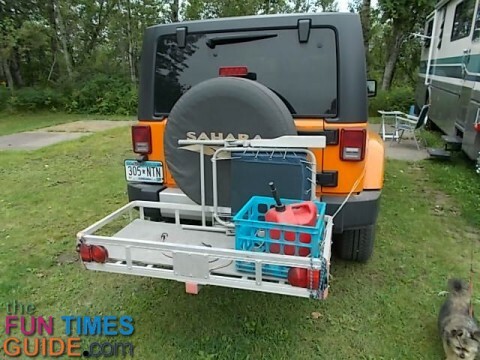 By adding a cargo carrier on the rear, you have increased the storage capacity for things you’d rather not carry inside your RV like lawn chairs, coolers, or a gas can for your portable generator. Even the generator itself can be carried on a cargo carrier, since most are rated to handle up to 500 pounds! Since I use an aluminum cargo rack (about $80), I hold the tow lights in place with bungee cords. The wiring included in the tow lighting kit is long enough and it’s completely plug & go ready, so I just run the cable along the side of the Jeep and loop it through the center of the grill. Altogether, it takes just a minute or so to pin the cargo carrier in place and string the lighting cable down the side. With this simple set-up, you can be on the road legally in about 15 minutes with zero tools involved! You can’t beat that for easy.